Microsoft Stream is now available for Office 365 Enterprise customers. With Microsoft Stream, users can upload, share, manage and viewing corporate videos that can be used for education, training, and cross-company information sharing. 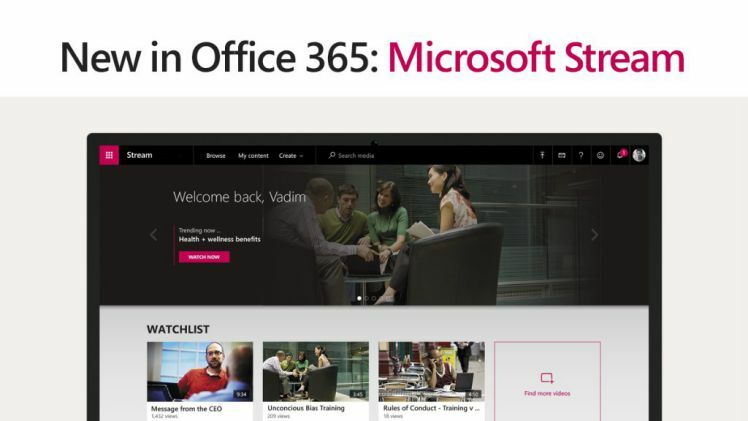 It is also now the cross-suite video service for Office 365 in the enterprise, making it seamless for people to share videos inside Office 365 applications like SharePoint, Microsoft Teams, and Yammer. Microsoft Stream has also integrated with Office 365 Groups, which means every group has a designated channel—making it even easier to manage content across teams. Speech-to-text transcribed audio—Transcribed audio becomes searchable text. Simply type in descriptive keywords to jump to any point in a video they are spoken. Face detection—With face detection, viewers can see where each person in the video is shown throughout the video. A clickable timeline indicates every place they appear. Linked timecodes—Timecodes are displayed within the comments section and are linked to the text transcripts or table of contents, so you can jump to a specific point in the video. Microsoft Stream utilizes built-in, industry leading encryption and authenticated access for video to ensure our customers are sharing content only with the intended audiences. Intuitive security features that utilize existing organizational identity through Azure Active Directory and Office 365 Groups make security management simple. Additionally, administrators can add custom guidelines or require employees to optionally accept terms before they can begin to upload videos. Videos provide a seamless and secure viewing experience across devices and screens and work wherever you are—at home or in the office. Microsoft Stream videos are also more accessible, with features like closed captioning, screen readers, keyboard navigation and high contrast. Microsoft Stream provides speech-to-text transcribed audio that’s searchable, face detection in videos, and linked timecodes. Microsoft also revamped the Stream user interface and added more granular management controls. Microsoft Stream is now available for Current Office 365 customer for free. If you don’t have Office 365, you can try a Microsoft Stream standalone plan.